In the 7th millennium, humans have spread throughout the galaxy and govern most of the inhabited planets. Leonardo, Our Humble Hero and purple-blooded Bjornn of the planet Benitarus II, is sent as an expert appraiser to the Claiborne Art Gallery on the mostly-human planet of Far London. Leonardo's enhanced ultraviolet and infrared vision are ideal traits for assessment and authentication of artwork, and he immediately catches the attention of an aging Far London collector who, in spite of his contempt for non-humans, is intent on retaining Leonardo's services. His instructions: Search the galaxy for any piece of art bearing the image of his obsession: the mysterious Dark Lady, a beautiful and somber human female whose exact likeness, he has secretly discovered, appears in paintings and sculptures throughout history - dating all the way back to Earth's ancient Rome. Leonardo's research reveals the link between the artists of the Dark Lady: human men who voluntarily risk their lives. If she appears to men who court death, she may be their Angel of Death ... or, as Leonardo hopes, the female of an ancient Bjornn legend - The Mother of All Things. To find her and learn the truth, he must first chase down the craziest human daredevil in the galaxy. ©1987 Mike Resnick (P)2012 Audible, Inc. If you could sum up The Dark Lady in three words, what would they be? I read this book about 30 years ago and still remeber enjoying reading it. The main character is a very non-humanoid alien which makes it a creative and intriguing read/listen. The performance is well done! An alien art expert tracks paintings of a mysterious woman, made over millennia by various men. Isn't that a great start for a novel? 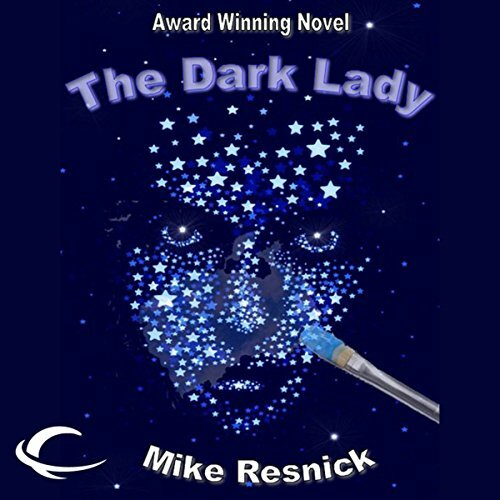 Like the typical Santiago novel, Resnick takes us for a ride across the stars, meeting the most improbable characters in the most unreasonable locations and who just do not want to do what we expected them to do. The reading is amazing and takes us all the way from the beginning to the end of the book. But the "good idea" does get old very fast as the book tends to fuel the intrigue through artificial new meetings in the story. This is the style that made Santiago great but it feels less worked out here. About half-way in the book, the story runs out of ideas is a forced-in with a new character which, in my opinion, is not well-constructed. The worst part is perhaps the ending, or is it just a summary of the entire book, with an attempt at poetry that simply ends up as seeming pointless with no real closure. I would not recommend this book except for those who are true Resnick fans.